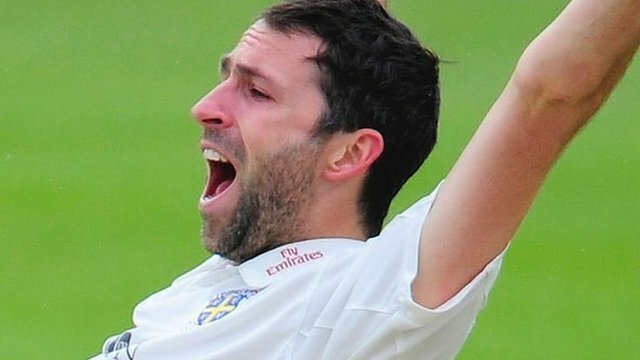 After arriving at the ground during the lunch break, after his release from England duties, Graeme Onions bowled his heart out on day one of the Division One clash between Durham and Nottinghamshire. After his drive up from Lord’s to Trent Bridge he produced career best figures of 9-67. He even had a hand in the 10th wicket by running out Luke Fletcher. The 29-year-old replaced Mitch Claydon at lunch, and after a few minutes limbering up he took the new ball and immediately got a break through, removing Alex Hales with the sixth ball of the innings, with one that kept very low. Michael Lumb was the next to fall victim to the right arm seamer, again LBW and Adam Voges was bowled two overs later. Rikki Wessels suffered the same fate as Hales, falling LBW with the score at 50-4. Notts’ captain, Chris Read, came and went without changing the score- Onions and Mustard combining and removing the former England keeper first ball. Steven Mullaney was the third LBW casualty and Onions’ sixth with Notts on 115. Paul Franks, who was the only man to provide any kind of resistance, finally fell for 53, again leg before. Skipper Collingwood then caught Graeme White and Notts were eight down. Onions was dreaming of the illusive 10 wicket haul but amazingly only had himself to blame, throwing from square leg and connecting with a direct hit to run out Fletcher at the non –strikers end. The next over Onions cleaned up Andy Carter and Notts were all out for 154. Durham had a lead of 40. They finished the day 27-0 and Onions could quite deservedly put his feet up, have a beer and let it all sink in. He tweeted after play that he couldn’t respond to all his texts because he was so busy. He posted a picture that showed 38 unread texts. He was certainly snowed under! Great performance from Onions, felt he should have been picked for the Test. Still should go towards keeping Durham in Div One. Hello Liam great blog from the scorer at Reed. Thanks Neil, glad you like it! Hope you go up this year! Cheers Liam enjoyed your company on Saturday afternoon, be good to keep in touch. Will do mate Cymru am byth.